After way too many experiments, I've come to the conclusion that Windows Installer is simply bad technology. But the customers want MSI files. So, how can I create an MSI file that extracts an EXE file to a temporary directory and runs it with options same or similar as were passed to the EXE file? Options to an MSI are explained in Msiexec (command-line options) (low level "run" of an MSI is msiexec option package.msi). EDIT: mjmarsh's WiX solution looks like it works. I just haven't had a chance to try it yet (crunch time). If it works, I'll be accepting it. EDIT: it does not work. Missing piece: attended/unattended does not seem to be available. Anyway, the only to make this work at all would be for the custom action to kill its parent process! Well, there is the free way and the $$$ way. I cannot document everything here, but this should get you started. On a side note, yes, Windows Installer is a maddening technology. There are many times where I think a task will be straightforward, but it actually becomes complicated. You definitely have to immerse yourself to understand it. 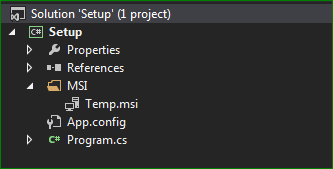 First create a "Basic MSI" project and make sure you say you want no setup.exe generated. You set this in the Release settings. Then you essentially do the same thing as with WiX, but you have a UI for it. You can insert the custom action by selecting "Install Sequences" and putting it in the InstallExecuteSequence somewhere between InstallInitialize and InstallFinalize as I said before. Sorry, I could not be more detailed, but this should be a good start. I think the easiest way to create a .MSI file is to use WiX. Lesson 1 from the WiX tutorial is all you need to create a simple install. Joshua, I understand your frustration very well. MSI is quirky to say the least - a completely new way to think of deployment. Still, applied correctly MSI offers the best possible deployment, especially for corporate customers. What operations does your installer EXE perform? Is it largely file copy, some COM registration and some registry writes, or does it run complex installation logic, setting up databases etc...? The reason I ask is because it probably would be very quick to create a well functioning WIX MSI for you so you can abandon the EXE approach. It is indeed possible to run an EXE from inside an MSI, but it requires proper sequencing, and it is guaranteed to cause you more blues than a simple MSI. If the app is small, and not doing anything crazy during installation, I would be happy to provide you with a basic WIX conversion. No solution. We went NSIS as corporate MSI install is going to be broken anyway due to MSI nesting problem (just try installing EXE wrapping MSI from inside MSI someday). There is also a free version of the MSI Wrapper. It also supports uninstall and upgrades. Also, it only creates one entry in the Add or Remove programs. Setting Return=asyncNoWai does not wait for the exe to return. The installer does it's job and closes normally. Meanwhile, the exe continous its execution. If you don't want to manage MSI, but only execute EXE, try Exe to MSI Converter Free. You just put in the path to the EXE and get an MSI. Try to execute your exe there, so when your exe invoke other MSI packages, it won't conflict with the first one. I build the setup exe using InstallAware. It has its own MSI Wrapper that wraps the generated EXE with MSI. It works OK, the EXE can call other MSIs without any problem (including .net setup, other 3rd party setups), but that is because the launching MSI ends ("returns") rights after it launches the setup EXE file, and that way they avoid the MSI limitation of recursive MSI calls. BUT - some customers (companies) that uses MSI deployment tools, requires the MSI (msiexec) to return (end) only after the setup process ends, and that is a problem with the above solution. InstallAware has the option to generate the EXE setup using their own native engine, and not based on Windows Installer engine, to avoid MSI recursive limitation. Combine those both, and you have the perfect solution. Hope this will help someone, although many years passed since this question was first posted. Nah man, just use Inno Setup's wizard. It makes an setup EXE but not an MSI. It's like 5 mins and you'll have a windows installer. Not the answer you're looking for? Browse other questions tagged installer windows-installer msiexec or ask your own question. How to set a check box to “unchecked” from the msiexec command line?